It’s inevitable that every once in a while we’re going to want to do something our tools just weren’t designed to do. This can be pretty frustrating, but it doesn’t have to stop us in our tracks–we just need to make our own tools. 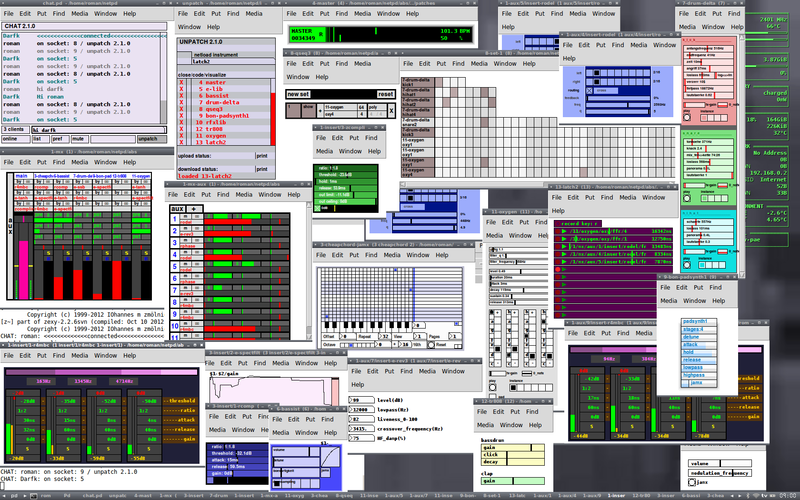 In this workshop we’ll use a free software progrm, Pure Data, to create our own sound and learn a bit about how to link our creations to non-traditional user interfaces (like, you know, the outside world). This is a short workshop, so we won’t be able to go too deep. However, this stuff is always best learned when there’s a concrete problem that needs solving. If you have an idea of something specific you’d like to accomplish, there will be time to discuss and get feedback/direction from the other people in the room. 1) A computer with Pd-extended (http://puredata.info/downloads/pd-extended) installed and working. You can prove to yourself that the basics are in order by running Pd-extended, and choosing Test Audio and MIDI… from the Media menu. When you turn on the Test Tones at either 60 or 80 dB, you should hear sound. is a musician, artist, programmer and educator based in Toronto. He has performed and recorded with some of Canada’s most notable artists, including Feist, Esthero and Jacksoul. He is active in Canada’s jazz, pop and experimental music scenes through solo work and various collaborations. His work, both musical and visual, playfully explores the unpredictable intersection of analog and digital experiences of the world. He is a member of the Board of Directors at Toronto’s InterAccess Electronic Media Arts Centre, where he teaches workshops and spends time exploring the interface between technology and the creative impulse, which generally involves taking things apart and finding himself unable to put them back together.